Digital business is here, and network connectivity is fundamental to its success. The modern enterprise demands agility and unending connectivity, and the network is now the enabler of digital initiatives—especially the network edge. Today’s edge is the new battlefront where enterprises can establish a competitive advantage; where employees, customers, partners and vendors all connect, literally and figuratively. It’s where IoT devices such as blood pressure monitors, fusion pumps, price checkers and sensors connect creating a whole new attack surface for security breaches. The edge is where valuable analytics are collected and where personalized service is delivered. In short, getting the edge right can translate to business success, and getting it wrong can have catastrophic effects. The confluence of technology, location, users and devices has created complexity. Locations where users connect have grown beyond the carpeted campus, into retail, manufacturing, healthcare, large event stadiums and locations around the globe. User connectivity now extends beyond Ethernet and Wi-Fi to include technologies such as Bluetooth, IoT and more. There is a maze of different hardware, operating systems, and services, all with diverse dashboards and user experiences that are unable to adapt as business needs evolve. IoT is massive, both in opportunity for businesses and the volume of data created. According to a recent IoT survey, 79% of IT decision makers have already implemented or are planning to implement IoT projects. The most common IoT deployments today are building-related projects involving smart lighting and energy management, followed by video surveillance and data collection projects. The management and security of IoT devices are key issues facing organizations. The network has become a new attack surface for security breaches from millions of newly-connected IoT sensors and devices ranging from blood pressure monitors tomontion sensors and door locks. Secured onboarding for wired and wireless IoT devices is needed now more than ever to ensure secure access of IoT devices onto the network. A key challenge at the edge is the sheer volume of data. As more users and IoT devices connect, the accompanying data deluge is plaguing organizations as they struggle to process, transport, analyze and act on the information. Traditional architectures, where traffic flows from the edge to the data center, are no longer sustainable. Increasingly, users look to cloud solutions for faster and simpler application delivery. Today, the vast majority, if not all applications are written for the cloud, with the global public cloud market project to hit $178 billion this year, up from $146 billion in 2017 (CIO from IDG). Public cloud adoption in enterprises is projected to exceed the 50% mark for the first time, and offloading compute resources is certainly becoming the norm. All businesses rely on uninterrupted mobile connectivity, as evidenced by the continued strong growth in Wi-Fi. 55% percent of IT professionals expect their business will spend more on networking, including wireless and wide area networking over the next year (Network Computing. The challenge is enterprise WiFi is one of the most onerous networking technologies to deploy and maintain, with 64% of network problems attributed to Wi-Fi (Network World). Today’s network security environment is a virulent one, with high profile breaches continuing to rise. No business is safe, as shown by the ongoing frequency of major brand name attacks. While malicious actors and their attack methods multiply in frequency and complexity, the impacts of digital transformation are also creating security implications for the enterprise. In fact, 69% of senior IT and security leaders report that digital transformation is forcing them to make major changes to their security strategy (Forbes and BMC). Fortunately, a significant amount of innovation is taking place in the networking technology space that are well positioned to solve the problems businesses are experiencing today. The use of artificial intelligence and machine learning can assist enterprisers in many ways; from enhancing security to assisting with operations to free up valuable IT resources. Machine learning can transform the legacy infrastructure management model by making operations simple, lowering costs and providing comprehensive insights into user behaviors, ultimately enhancing the productivity of network analysts and operators (Network World). The dominance of the cloud, hybrid IT strategies and multi-cloud services certainly aren’t going anywhere, and they’re heavily influencing the way the enterprise network is delivered. By 2020, data centers will only account for 50% of the market, while public cloud will dominate a third of the market as private cloud captures 20% (IDC)—so choosing the deployment model that will bring the greatest benefit to your business is key. Keep in mind, multi-cloud connectivity offers businesses the flexibility to mix and match cloud technologies and services from different vendors to suit their exact needs. These can be multiple public clouds, multiple virtual or on-premise private clouds, multiple managed or unmanaged clouds, or a mix of them all. For enterprises to succeed today it is imperative that they differentiate and personalize services to cater to the needs of their customers. Data is an undying tenant of digital transformation, and networking solutions enable organizations to arm themselves with actionable analytics to better understand network performance, track customer engagement, improve operational efficiencies, and monetize the network. Analyzing network and user behaviors and shaping them accordingly with business insights, contextual information, and location-based and application analytics allows businesses to optimize and personalize the engagement and experiences of end users. Today the network edge is a strategic enabler of digital transformation and business operations. To ensure the success of your transformation, it is important to pay close attention to edge investments and explore how innovations in machine learning, network automation, multi-cloud solutions and security can help your business. Luckily, at Extreme Networks we’ve dedicated a great deal of time and research to delivering innovative solutions for the edge. Stay tuned for future blogs and announcements. Can’t wait? We can help you with your pressing edge and mobility challenges today. Connect with an Extreme Networks expert now, or call us at 1.888.257.3000. 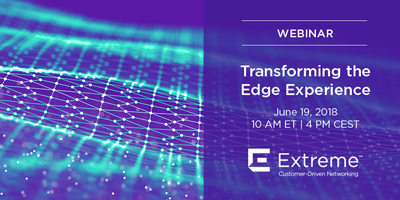 Be sure to join our 6/19 webinar, Transforming the Edge Experience, with Zeus Kerravala, Founder and Prinicpal Analyst with ZK Research, Norman Rice, Chief Marketing, Development, and Product Operations Officer at Extreme Networks, and Mike Leibovitz, Senior Director of Product Management at Extreme Networks, to learn how you can transform the edge experience for your customers to gain a competitive advantage.